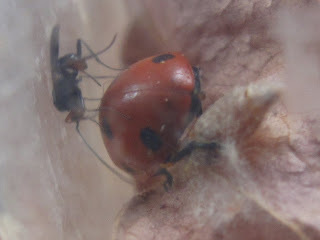 I had completely forgotten I had put the parasitised ladybird (see previous post) on a plastic container to see if the parasite wasp emerged and to be able to take some photos. I checked regularly the first few days and nothing happened. 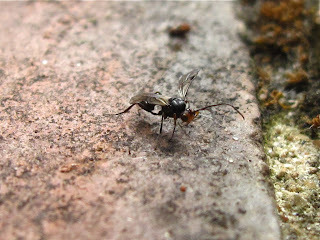 Today, sixteen days later, I came across the container and there was a tiny wasp, flying about! The ladybird was still alive and it could now move its front and middle legs. I managed some shots of the pair together. The wasp returned to the ladybird again and again, inspecting it with its antennae. I released the wasp in the garden and it settled nearby so I could take one final shot before it flew away.